Increased costs of NPK fertiliser have caused many farmers to switch to straight nitrogen, but in some situations this has resulted in significant reductions in grass production. Such reductions have often been attributed to phosphorus (P) deficiency, whereas in fact they have almost certainly been due to either potash (K) or sulphur (S) deficiency. Proper management of K and S inputs to grassland is essential, particularly in spring, to ensure optimal grass production and to minimise risk to animal health. Potash and sulphur are often forgotten about, but an adequate supply of both is essential for optimum grass production. Without a soil test every 4-5 years, potash deficiency is not easy to identify. Yield losses can occur without any recognisable visual symptoms. However, when symptoms do occur, more than 40% of dry matter yield may already have been lost. A grass silage crop can remove up to 30 kg of potash per tonne of grass dry matter harvested. Organic manures are a useful source of potash and can provide a large proportion of potash requirements at relatively low cost. Along with yield benefits, having sufficient potash present within the soil is essential to enable optimum nitrogen uptake and utilisation by swards. Potash deficiency is common in Northern Ireland (NI). A recent survey by AFBI of 500 farms (12,000 fields) across NI has indicated that 20% of fields on dairy farms and 26% of fields on beef farms, are low or deficient in potash with soil K indices at or below. On a Province-wide basis, applying additional potash as slurry or fertiliser to such fields could result in 400,000 tonnes extra grass dry matter, worth up to £40 million to the industry. Potash overuse, however, is also a problem, with 33% of fields on dairy farms and 25% of fields on beef farms overly enriched with K (Index greater than 2+). Too much potash can reduce magnesium uptake by swards and lead to grass tetany (hypomagnesaemia), which can result in cattle deaths, particularly suckler cows grazing spring pastures. 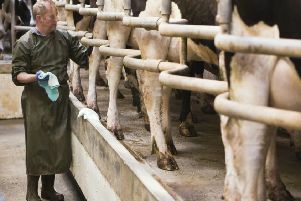 Milk fever (hypocalcaemia) is also linked to excessive concentrations of potash in dairy cow diets. Dry cows fed forages containing moderate to high levels of potash are more susceptible to milk fever following calving. Potash reserves in soil are more effective at supplying swards than fresh fertiliser applications. Potash depleted soils (K index 0 and 1) will often fail to produce the same yields as fertile soils even if much higher rates of potash are applied. Adequate reserves of potash should therefore be maintained in the soil by using fertilisers and manures to replace what is removed by cutting or grazing. Sulphur deficiency in grass swards remains a high risk in NI, particularly on light sandy/free draining soils, but is also prevalent in heavier textured clays and clay loam soils. Sulphur deficiency manifests as a uniform yellowing or paling of grass shoots across all ages of leaf tissue, coupled with a loss of yield. It is particularly prevalent in spring. Sulphur deficiencies can reduce grass yields by as much as 30%, and cause significant economic loss to farmers. AFBI research has demonstrated that winter soil sulphur test results do not provide a fool proof indication as to whether or not swards will be sulphur deficient in spring. To eliminate any such risk, NS or NKS fertilisers should be applied routinely to all grass swards in spring (silage and grazing) when growth requirements are highest. On heavy textured soils, the spring application of sulphur should eliminate any further need for sulphur that season, whereas on lighter textured soils follow-up applications of sulphur may be necessary during the season. Although slurry contains sulphur, much of it is not readily available to plants, and slurry alone will not meet the sulphur requirements of silage crops. By routinely applying sulphur containing fertilisers (at an additional cost of up to £8/ha/cut or grazing), farmers could prevent yield losses worth up to £60-90/ha/cut or grazing, and as long as the fertilisers contain less than 10% SO3, there should be no risk to animal health. - Soil testing is essential to manage your potash levels. - For soils with low potash reserves (K index 1 or 0), extra fertiliser potash should be applied in the autumn to restore fertility to target levels. - Where soils are overly enriched with potash (K index 4 to 5), fertiliser K usage and manure application should be lowered or even omitted altogether to reduce the risk of grass tetany and milk fever in cattle. - Silage and grazed swards on light textured sandy soils should receive fertiliser sulphur for both 1st and 2nd cut crops and for 1st, 3rd and 5th grazings (even if slurry has also been applied) at a rate of 2.5 kg SO3 for every 10 kg N applied, using an NS or compound fertiliser with less than 10% SO3. - Silage and grazed swards on heavier textured clays and clay loam soils should receive fertiliser sulphur for 1st cut and 1st grazing only (even if slurry has also been applied), at a rate of 3.5 kg SO3 for every 10 kg N applied, using an NS or compound fertiliser with less than 10% SO3.